Why couldn't the Daddy ghost father a baby ghost? Wait for it...because he had a Hallo-weenie!!! Get it?! HAHAHAHAHA! I decided to save this week's update (25 weeks already??!!??!!) for tomorrow because it's Halloween and I wanted to show you some hilarity in photos (LOTS of them). We were hoping for lots of trick-or-treaters this evening but guess how many we got? 2. Since I basically bought Wal Mart out of all of their candy, I expect to have gained 20 lbs this week alone when I have to weigh in at the doctor on Friday...we have so much left over and my will power has disappeared...I can't seem to stop eating it. I think it was partially this nasty weather and partially due to the fact that apparently my neighbors are fun suckers because there were only a few porch lights burning on our street. Sigh. Maybe next year! Anyway, we got in the Halloween spirit last night by carving our pumpkins...better late than never, yes? Time for carving...Dan hovered the whole time and was worried because I'm so clumsy. Worry wart! What Dan wanted his jack-o-lantern to look like. I have no words. See the pink inside the pumpkins? Hilarious story: I somehow had no tea lights and we therefore had to use candles from Bath & Body works as our pumpkin lights. At least our front porch smelled delicious! Yum, homemade chicken noodle soup and grilled cheese. I die. Hope your Halloweens were as awesome as ours was! Happy Sunday, followers! I hope everyone has had a fantastic weekend. The weekend at the Baum household was a busy one indeed, but I am feeling better having marked one huge thing off of my list of things to obsess over worry about. That's right, yesterday was registry day. I wanted to get it marked off my to-do list. Just walking into baby stores is overwhelming, so I knew registering would stress me out. As a result of said worries, I spent a LOT of time preparing. I did tons of research (I mainly used consumer reports, Amazon reviews and other Mom friends). We also went and visited baby stores quite a few times before registering so that we could make the big decisions (read: stroller, car seat, nursery furniture, etc. as blogged about in previous posts) before registering so that it wouldn't take as long. Although I'm sure Dan was annoyed to have missed a few Saturdays/Sunday afternoons of football, we were both actually really glad we did this. It gave us time to think about it, do more research, and make informed decisions AND I think it caused the registering process to take a lot less time than it otherwise would have. I was exhausted after every visit, so breaking it up worked out well. All in all, the registering process went a lot better than expected. I felt like my research paid off, even though I can admit that I am borderline ridiculously OCD. The first thing we did was decide on where to register. In the end, we went with Buy Buy Baby and Amazon Baby Registry for several reasons (If you want to skip the rest of this paragraph, here are the non-long-winded summarized reasons:  not ghetto,  better selections of brands we were looking for,  awesome coupons and price matching, and  return policy). First, last month sometime we went to the Babies R Us closest to us to look at strollers, because the BuyBuy Baby closest to us at the time was around 45 minutes away (in Durham). Not only did BRU not have any of the strollers we wanted to look at, but it was seriously ghetto. I was afraid that I was being overly dramatic when Dan turned to me and said, "I'd rather make the drive, this place is gross." Obviously, this is not the case with all BRU stores. I have heard that the one in Durham is very nice; however, since we were making the drive to Durham, we decided to drive a little further and try the BBB since they carried a lot of what we were interested in looking at. Turns out, BBB opened a Morrisville store about 3 weeks ago, so it worked out perfectly - close to us and brand new (read: not ghetto). A second reason I like BBB is because of the coupons. They are owned by Bed Bath & Beyond and therefore have the same coupon system: they send out 20% off one item coupons via e-mail and mail on a regular basis. The only difference is, at BuyBuy Baby you can't use expired coupons like you can at Bed Bath & Beyond, BUT they will accept Bed Bath & Beyond coupons that aren't expired on all items except furniture. Score one for us, as well as any gift givers. We were able to use a 20% off coupon for each piece of furniture we purchased, and it saved us a lot of money. Additionally, they will price match any competitor coupons or sales prices. Some people have said that sometimes things are slightly cheaper at BRU, but since BBB price matches, I'm ok with it. Can't beat the awesomeness of this store, I'm telling you. One final reason that we chose BBB over BRU that I hadn't even thought about until hearing about my bestie's experience is their return policy. I am sad that she is having to deal with all of this, but glad that she told me about her experience so that I could ask about it when we registered. In a nut shell, they have had several showers and were given a lot of gifts with no receipt. BRU will only let you return/exchange items without a receipt up to $75 per year per address. So, for example, they got the high chair that they registered for but were hoping to return it to get a different color - over $75 so they can't. I understand why stores like BRU, Target, etc. are doing this, but it still stinks. And really, it's not like you can go back to the sweet church ladies and be like, "Hey thanks for what you bought me but do you by chance have the receipt?" When I asked about it at BBB yesterday, they said that we would not have that problem in their store. They said that since we registered, even if an item was not purchased off of the registry, our registry serves as our receipt and we will not have to worry. Score again. Additionally, one of the other Moms registering yesterday told me that usually if whoever bought you the gift uses a 20% off coupon, it isn't run through the registry, so if you are returning sans receipt you get a store credit for the full amount of the product, not taking into account the 20% off. Loves. Added bonus? They have a SWEET gift wrapping station. Possibly all baby stores have this and I've never noticed but I was impressed with it anyway. We arrived to register, and due to the yucky weather yesterday, we hit the only snafu of the day: everyone else had the same idea. There were literally 6 other couples who showed up around the same time as us wanting to register. It didn't end up being a big deal - just took a little longer than it would have had we gone on like a Tuesday afternoon. Part 2 of this snafu was that since the store is brand new, so are the employees - so the woman who was assigned to help us was slightly clueless on the registry process and as a result created a registry for us 3 different times. So, those of you who are curious and did a search for ours and saw 3 come up: ours is the last one listed, #12522220, and they're working on deleting the others. We also registered at Amazon because they have a huge selection of everything you could possibly ever want. 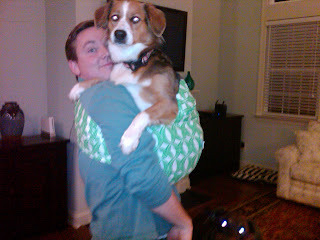 Additionally, the pack 'n play was the only thing Dan wanted a say in, and the one he insisted on of course cannot be found in any store. Both have great benefits, return policies (Amazon's is 365 days! ), completion discounts, etc. so I'm really happy with both choices. Not kidding. I started with the BBB book that they give every couple who registers - I requested mine on one of our earlier visits when we were looking at strollers so I could begin my research (ugh, nerd). I also printed out all of the e-mails and blog comments I've gotten from girlfriends with must-haves (special thanks to Emily, Lindsey, Andrea, Diana and Carly - you were all so helpful!). Since there wasn't a ton of room in the registry book to make notes, I transferred the checklist into an excel document and added a column for which specific brands we'd decided to get, based on our research as well as recommendations - and then I included a column for checking things off. To be safe, I also turned this into a Google document and e-mailed it to both Dan and myself so that we could take the iPad in case that was easier. To be fair, this part of the crazy was suggested by Dan, but considering that I was mad that I hadn't thought of it first, I guess we're even. We did not end up using the iPad - my dorkalicous handy dandy excel checklist worked just fine. Also, thanks to Steph for suggesting that I take water - I would have never thought of it. I took a bottle, but they also gave us as many bottles of water as we requested while registering - score yet another one for BBB. This is getting long, so I'll try to wrap up quickly. Registering went very smoothly - there were no arguments, so I was surprised. He won on several items, I won on several others - compromising at its finest, folks. Towards the end, I realized that the snack supply I normally keep in my purse had been depleted the day before in an emergency situation, so I got crabby, but that was the worst of it. I let Dan be in charge of the scanner gun, so I knew there was no telling what would show up on the registry - and we had some cleaning up to do anyway (i.e. things we scanned and changed our minds about but couldn't figure out how to delete, things we realized we forgot but I was hungry and NOT going back through the store, etc. ), but we took care of most of that today. The whole process, from the time we started scanning, really only took around 2.5 hours - so that was a bonus of having gone in several times before to test some things out, I suppose. I'm sure that I will do some editing between now and my showers - I have plenty of time - but all in all I feel a lot better having just gotten that marked off the list. 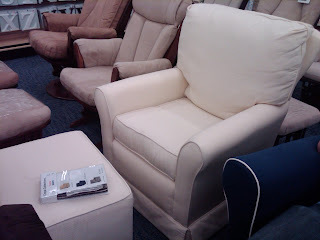 The color pictured is the one we went with (I guess there are several pictured, but it's the cream-colored one with the swatch book laying on the ottoman) - you can't tell, but it's textured - they almost look like little squares. 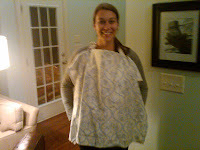 I took my nursery fabric samples and laid them out on the ottoman to make sure they matched, and they look perfect. Anyway, it's really pretty. It was in stock but we decided to wait and have it delivered with our furniture (whenever it comes in) since neither of us have a huge car. Using the handy 20% off coupon that my future brother-in-law got for us by signing up for e-mails (thanks Joshie! ), we got a great deal. I guess I've bored you enough with this post. Today, Dan has a retreat all afternoon for one of the boards he's a member of, so I'm going to do some grocery shopping, clean up the house, and have a delicious pot of chili waiting on him for dinner when he gets home. Yum! 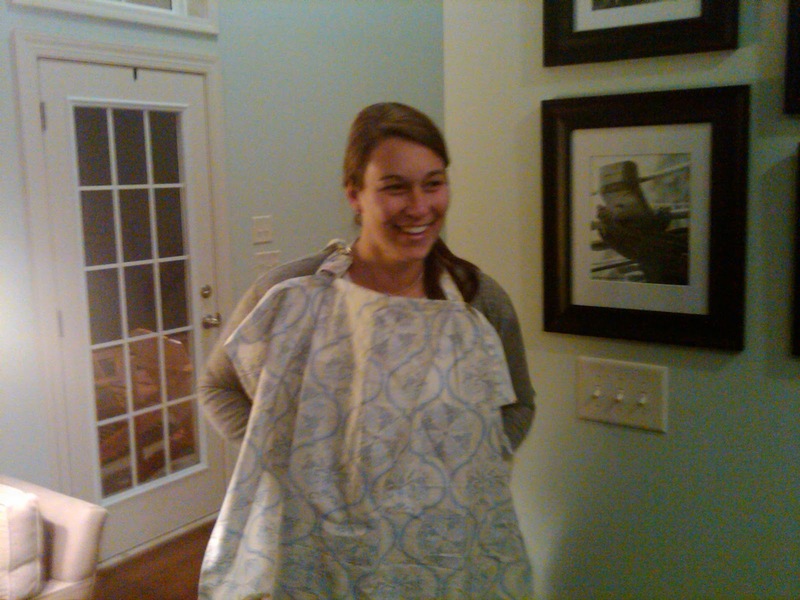 Then we're carving pumpkins, and I'm really excited about it. Better late than never, right? That kind of week, really. Glad it's over! Tonight I'll be enjoying a glass of wine (no judgment!) 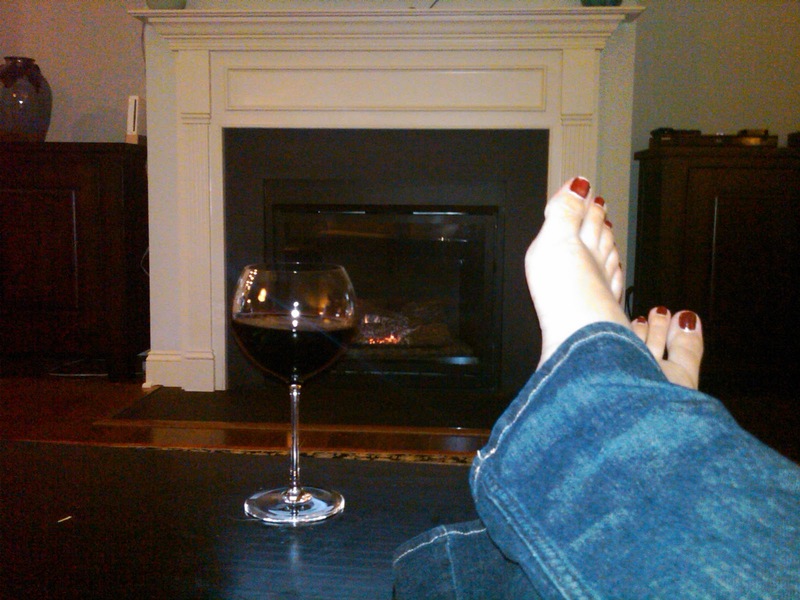 by the fire (I know you can't really see it but it's there) with my feet propped up. My definition of Heaven. Tomorrow is the big day: registry day! I'll report back on how it goes. So sorry for the lack of blog posts the past few days - work is crazy and I'm exhausted! So today I had my first foray into fame: OUR EPISODE OF THE PRICE IS RIGHT AIRED! You don't have to watch the whole thing, obviously, but PLEASE if you don't watch anything else, fast forward to around the 5:15 mark and watch Dan get ignored in his request for a high five (we are right to the right and just behind the contestants). 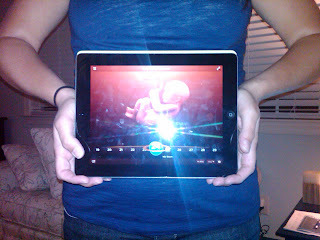 I was trying to put the video on the blog, but I can't figure out how since I can't find it on youtube soooooooooo just click here. Size of Geronimina: Still growing! She weighs just over a pound this week, and is almost a foot long - roughly the length of an ear of corn. An ear of corn is living in my belly! Lots going on this week in the way of development: she's steadily gaining weight (Don't get too big baby girl, Mommy's lady parts hurt just thinking about your arrival! Side note: please do not read this and judge me, of course I want her to be healthy. I'm just saying, the thought of pushing is already giving me anxiety.). Her brain is growing quickly, her taste buds are continuing to develop, and her lungs are branching out. Also, her skin is starting to thicken a little so that she's not so see-through. Cravings: Still sweets, but this week I am craving salty as well. I am putting off buying Halloween candy for the trick-or-treaters until the last minute because I don't trust myself in the same house with it - there is not currently enough chocolate in the world to satisfy my cravings. As for salty, I have been digging cheezits (only the BIG ones, of course - trust me, they're better) and popcorn. Aversions: None! Unless you count the terrible gas Layla had last night. Shoo, Layla! Symptoms: Same old story here. I have noticed that I have gotten a LOT hungrier in the past week, if that is possible - not sure that counts as a symptom. Congestion when I first wake up, random hair growth, fatigue, breakouts - you know, the usual. One that isn't really "new" but I don't think I've blogged about it before because it has only gotten noticeable/painful recently is a cramping sensation - apparently this happens when you're uterus is growing and stretching out. Oh and HEARTBURN. Can't remember whether I put that last week, but I swear I get it from everything. They say this means she'll have a full head of hair when she makes her debut. What I Miss: Can't really think of anything to put here this week, just enjoying the pregnancy. Things I am Thankful For: The weekend at home to get some things accomplished! 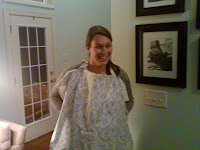 I was of course sad to miss ASU Homecoming and Heather & David's couples shower for their baby boy (coming SOON! ), but we made a lot of progress this weekend in marking things off our "to do" list. What I’m looking Forward To: Registering in the upcoming weekend! I'm really excited about it - whether I should be worried based on past registering experiences with my husband remains to be seen. We have been doing a ton of research (Don't even say it, I know it's dorky), and I asked for a list of suggested items when we were in BBB last week getting our furniture. In addition to that, I have been printing out suggested items lists from all over the online as well as asking for advice from all of my girlfriends who already have kids, so I think we have a good idea of what we want, which I'm hoping will make the process go pretty smoothly. I'll try to get the flash situation fixed before the next update. Next Doctor Appointment: Next Friday, November 4. Just a check up, and I'm actually not even meeting with a doctor - just the nurse practitioner. I need to go ahead and take my forms in for work and have them filled out, so that is exciting/scary. I guess that just about wraps it up! Time to fall asleep on the couch watch football with my husband. 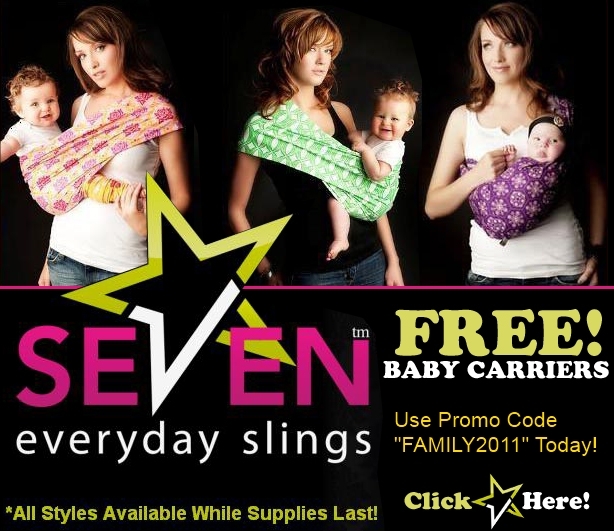 That's right, Planning Family has partnered up with Seven Slings once again to give away a free baby carrier. 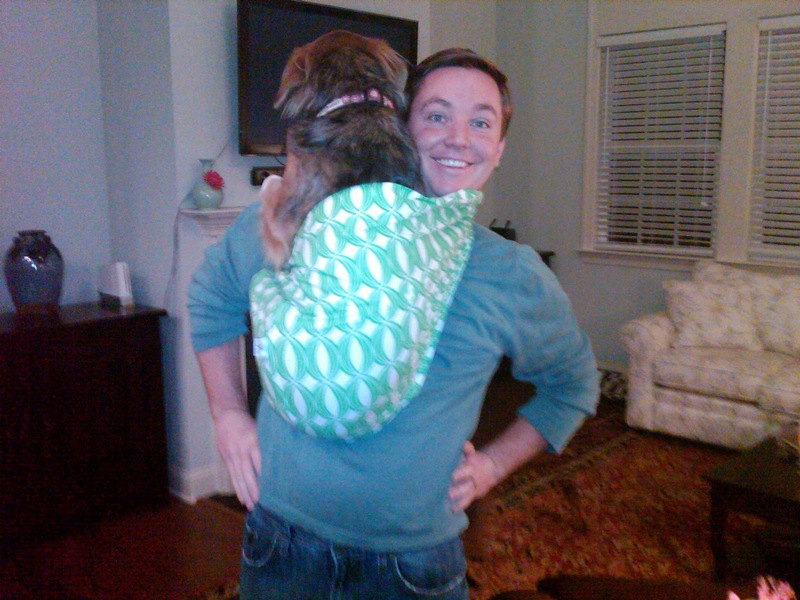 I may actually get another one of these now that I know that Baby B is a girl, because they're pretty nifty. Just enter FAMILY2011 at checkout and it's all yours! You can use the promo code more than once - you just need to open in a new browswer. Nursery furniture has been a pretty big decision (much like all of the others) in the Baum house. The problem that we're having is that Dan is cheap "likes to get value for his money" (his words, not mine), where as I will find the only $100 item in a store filled with all $1 items and have to have that one like pretty things and probably don't pay as much attention to price as I should. One thing is for sure: nursery furniture is a LOT more expensive than either of us anticipated it being. We weren't really sure where to start, so we began by just looking at things we liked online to get an idea of style. We did this mostly on furniture websites. Luckily, we agreed on style (which I never thought would happen), but when it came time to price things we liked, we were shocked at some of what we saw. Just birthing a child is so expensive, even with deductibles and maximum out of pockets, so the problem we were having is that it was going to be really hard to justify spending $2,000 on furniture. The nursery is a special place, one in which we will be spending a LOT of time with Baby Geronimina, so you can see why I want it to be beautiful. 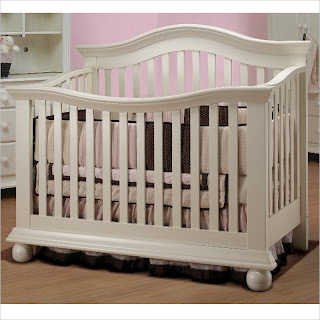 However, while furniture truly is an investment, the furniture itself is just the beginning of the nursery - $2,000 just seemed ridiculous when we still hadn't considered bedding, a rug, decorations - anything else. Obviously, a baby does not need all of these furniture pieces - those are just on the wish list for the nursery of my dreams slash when the money tree starts producing $100s. 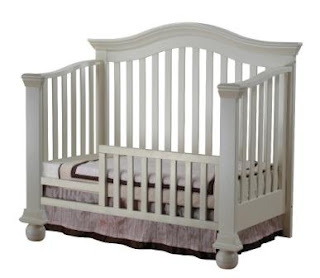 Realistically, I knew that the crib and changing table were most important, with glider in a very close 2nd (3rd?) - I am planning to breast feed and every Mom I've talked to said that a glider/rocker of some sort is as must. ﻿When I saw this crib, I fell in love - isn't it so pretty?! Part of it was the legs. I don't know why, but I love how they are rounded at the front. Anyway, we ordered it in dark wood. I like the idea of white, but in our current house, when we have more than one child they will probably share a room, and I just for whatever reason felt like dark wood would be better. Espresso was the exact color we chose. This way, Baby Geronimina will stick with her same bed until she's a toddler, and then we'll cross other bridges as we get to them. The sales associate did tell us that if we didn't get the kit that converts to a full bed but decided later on to go that route, all we'd have to do is get a full bed frame and drill it directly into the headboard. Excellent to know - it's always nice to have options! 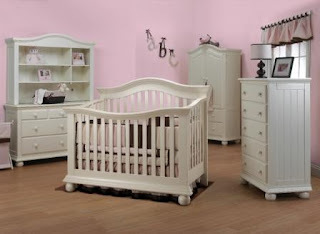 The pieces we ended up with were only two off of my original wish list: the crib and the convertible dresser/changing table (in the picture, it's the shorter dresser with the hutch). I really, really, R E A L L Y wanted that hutch (cannot express to you how much I want the hutch), but couldn't get Dan to budge. All we could agree on is that we will put it on the registry. It is definitely not a necessity - I just think it looks nice. We briefly considered getting the second, taller dresser, but decided we would see how it goes and if we need it we can always order later. My dreams of an armoire were crushed because they are stupid expensive, but maybe when our money tree sprouts in the back yard I'll go back for it. The only other thing we should still need for the nursery, furniture-wise, is a glider. I am currently trying to convince Dan that I am not, in fact, being high maintenance, and this is something that is a necessity, not a want. I sold the furniture that's currently in that room this week, so I'm hoping I can talk him into putting our proceeds towards a glider. We're going back to register next weekend, so fingers crossed that I can talk him into it before we go back! All in all, we had a very productive weekend and as a result I am feeling a lot less stressed about where we stand. We got a great deal on this furniture and were able to use 20% off coupons in addition, so we spent a lot less than we originally anticipated, and we're really happy with that. The only downside is that we had to special order the furniture, so they told us it would be 16-18 weeks before it arrives. 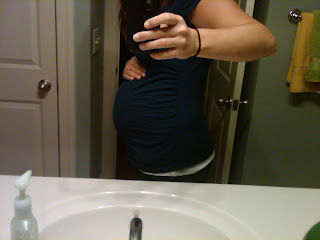 Newsflash: baby girl is due in 16 weeks. They assured us that 16-18 weeks is the worst case scenario, and that most of the time the furniture arrives earlier. Fingers crossed! I'm sure we will have a bassinet that she can sleep in if the furniture doesn't come in, but y'all know how I like for things to just be done. Next weekend, we're planning to register, so that will be one more thing to mark off the list - lots of research to do this week! Then, it's back to nursery decorating: we need to make a final decision on bedding, and I need to get Dan on board with my vision. So far, he has put his foot down that wall paper is not allowed (even though I only want one wall!). Not to worry, I'll keep trying! I am sure you have all been waiting with baited breath to know what we finally decided about strollers. I can assure you that I did not keep you waiting on purpose - we didn't make a decision until today! Now, I will admit that originally when this kept coming up in reviews, it did not even cross my mind to consider it. Why, you might ask? Because of the word "jogger" in the title. No, that is not a joke. Those of you who do not know me well may not know that while I go to the gym all of the time because I am constantly trying to lose weight (or in my current state keep active and healthy and minimize the gain if I can), I hate to run. H A T E. I would literally rather do anything else. Including drive my car off the nearest cliff. I really wish I liked to run, because people really seem to enjoy it plus it's kind of trendy these days and there are lots of cute running clothes, but sadly I do not. Anyway, I assumed this was a running stroller much like the super trendy and awesome Bob and decided it wasn't for me. The only downside, she said, was that you end up having to buy a lot of the parts separately (especially if you want the bassinet), so it ends up being closer to the price of the UPPA than the Britax. I forwarded Emily's e-mail to Dan along with a link to the website, and I think it was love at first sight. Instead of seeing my name pop up in his inbox and immediately choosing to ignore or delete like usual, he sent me approximately 10 e-mails about how cool it was and spent a good amount of time watching the videos on the website about all of the different configurations. He's a nut. I will say that while I was originally annoyed that he cared about what stroller we got, in the end I've been happy with his involvement - he has consistently brought up things I hadn't thought about. PRICE: Tie. UPPA is slightly more expensive, but not enough for it to really matter. You have to buy the infant carseat as well as an adapter separately for both strollers. The UPPA comes with the bassinet, but you have to buy it separately for the Baby Jogger if you want it, so that's what makes the price close to the same. Honestly, if we go with the Baby Jogger, I'm not sure we'll get the bassinet anyway - the sales associate helping us today told us that you can only use the bassinet attachment for both strollers for 3 months, and that most babies outgrow it length-wise before then anyway. Disclaimer: I have not researched this claim, but if it's true it seems silly to spend the money. WHEELS/STEERING: Both are very good, but UPPA has the edge and is therefore the winner in this category. The turning was slightly smoother which made the stroller slightly easier to maneuver. WEIGHT: The UPPA is slightly lighter in weight. HOWEVER, that is because it is also a little smaller. 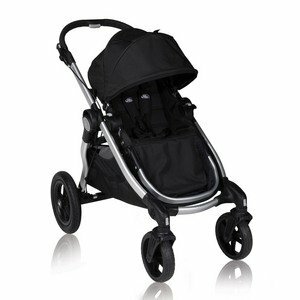 The Baby Jogger has a longer/wider frame, making more room for the toddler seat, which makes it a few pounds heavier. EASE OF USE: Baby Jogger, by far. The UPPA took us forever to figure out, and even after the sales associate came to show us, it took a few tries to fold it. The Baby Jogger, in our opinion, was much easier - press one button and it folds right down the center, piece of cake. User-friendliness is going to be key with the grandparents, I can assure you. ROOM TO GROW: Baby Jogger. We both liked the idea of making an investment on a stroller that can hold both baby and toddler, as Baby Geronimina will likely have a sibling sooner than later (not immediately - don't get any ideas, Mom). This is originally what drew me to the UPPA, but after we saw the rumble seat we were a little more hesitant. I am sure plenty of parents use it and love it, and I have plenty of girlfriends who have this stroller and love it (none with two children yet), but it just seems so small and cramped when you have the carseat attachment on. The bigger frame on the Baby Jogger allows for an actual full toddler seat which can be configured quite a few different ways, and there is a lot more room. So, a tie. Awesome. In the end, ease of use and room for the toddler seat was very appealing, so we decided to go with the Baby Jogger. I know this seems like a silly decision to have stressed so much over, but it truly is an investment. We will be using this stroller for a long time, and for the amount of money we will be spending, we just wanted to consider every possible aspect to make sure we were choosing the right one. We also decided to go with the Chicco Keyfit 30 Infant Car Seat. The safety ratings speak for themselves on this, and we liked the fact that these seats can be used on any of the strollers we were considering - very versatile. 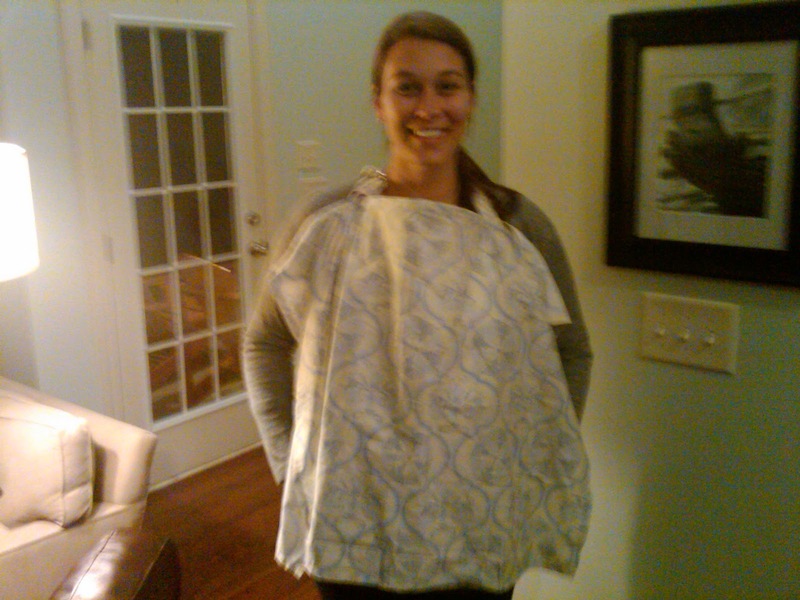 Additionally, the fabric that's used seems like it will be very easy to clean. I think we'll probably go with a black stroller, and I am leaning towards either the green or yellow car seat. So, that was the first accomplishment of today - it may seem small, but just having made the decision decreased my anxiety by a LOT. Other accomplishments of the day: deciding on nursery furniture (more on that in a later post) and a successful trip to the Apple store as an early Christmas present to each other. Whew, that was a long one - hope I didn't bore you! Several stresses knocked out - not too shabby for a Saturday. Hope everyone is having a great weekend! Howdy, followers! Hope everyone's having a great week so far. Today I would like to discuss with you a kind of new topic: cord blood banking. Ever heard of it? I hadn't either, until I was pregnant. Brace yourselves, a boring intriguing discussion is about to ensue. Cord blood is the blood that stays in the umbilical cord after it has been cut when the baby is born. It contains unique stem cells that can be used in some medical treatments. Often times, it is discarded. OR, these days, you can save it...for a price. The stem cells that are found in cord blood can be used in many different medical treatments to regenerate healthy blood and immune cells. It has been used to treat life-threatening diseases including leukemia and other cancers. Additionally, there have been a lot of recent studies which show that it may have the potential to treat conditions such as juvenile diabetes, which currently have no cure. Basically, by collecting the cord blood after the baby's birth (which is apparently simple, safe, and painless for both Mommy and baby and must occur within 15 minutes after birth), you will have the peace of mind that should a medical emergency occur for you, the baby, any siblings, etc., the cord blood may be able to help with treatment. Blah blah blah, I know this may all sound totally boring - but it is a relevant and very prevalent discussion in the medical community today. My Mom actually brought it to my attention the other day - she works with someone who is pregnant, and this woman is on the fence about whether or not to bank her baby's cord blood, so Mom asked me what my stance is. Truthfully, I'm on the fence, too. When my Mom's co-worker talked to her doctor, the doctor told her that as of today, not enough research has been done for the cord blood to be as valuable as the banks want you to believe, because it currently has limited uses (with hopes for improvement in the future). The doctor described it as more of a marketing ploy, and advised her not to bank the cord blood. It is a good question, and something to think about. I have had it on my list of topics to research, but I hadn't even thought of asking my doctor - I think I will the next time I go, just to see what she says. I discussed a lot of pros to cord banking above, but one big con is that it's pretty expensive to bank your baby's cord blood. According to the research I've done, it can cost anywhere from $900 - $2,100 initially, with an additional annual storage fee of around $100/year. I know that in the long run it doesn't seem like a lot, especially if there are a lot of break-throughs for usage; however, up-front, it's a lot to spend - particularly when you add in all of the other expenses associated with a baby. I've said it before and will continue to have nightmares fret over this fact: babies are not cheap. Even if I was given everything I could ever possibly need for this baby and didn't have to spend a dime on furniture, a stroller, clothes, accessories, etc. it is expensive to even give birth - and that's with good insurance. One alternative that I haven't yet discussed is the option to donate your baby's cord blood so that another family can use it. I still have a lot of research to do, and I still want to talk to the doctor, but I feel like at the minimum I would probably be willing to donate - can't hurt to try to help save someone else's life, right? So, there you have it. Thoughts? Do any of my Mommy friends out there have any experience with this? Did any of you bank your child's cord blood, or donate it? If so, can you offer any advice? Hump Day's over - not long now until the weekend!